What was this treasure? Have they started stocking cheap minis? Are they selling rules sets in their budget bins? The short answer is no. Don’t grab a trolley and rush there thinking Lidl could replace your annual visit to Salute. Instead I found a fantastic wargaming mat at Lidl. of course it wasn’t marked as a wargaming mat. No. It was being sold as a garden mat – you know those fake grass mats that look super tacky stuck on roofs, balconies or even inside a shed. Let’s start with the size. It measures 200cm by 100cm (6′ 6″ by 3′ 3″ to those in the imperial world). That means it is A bit narrow for regular tables, but makes up for it in length. 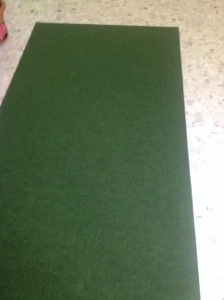 Given that it only costs €8.50 a mat, you can easily afford to buy more than one to make bigger playing surfaces. 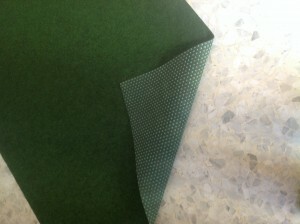 The surface itself is a dark summer green, with excellent texture that allows miniatures to glide across. It is very hard wearing (my daughter walked across mine while it was laid out on the floor and I spent a couple of hours kneeling on the edge of it with absolutely no effect). It is backed by a textured rubber surface that is water-proof, makes it easy to roll flat as it gives the mat weight, and grips any surface you lay it on. I liked it so much I bought five. Yes, I want to make a playing area some 13 feet long and 6′ 6″ wide. Downsides? Well, it only comes in one color. And the local Lidl only get a stock once a year. Otherwise it is bloody awesome. Lidl and wargaming – who knew! But I will never moan about going grocery shopping again!